A new study on more than 400 000 customers reveals that 15-20% initial promotion optimizes lifetime revenues. Read more below. Retailers use promotions to generate temporary sales boosts. However, they increasingly also use initial promotions to build long-term relationships with new customers. The challenge is to know how deep promotions to make? In a new article, published in Journal of Marketing (Rio Olivares et al. 2017), researchers evaluate the impact of promotions on customer loyalty and lifetime revenues. Two large-scale field studies in an insurance company’s car insurance branch and property insurance branch provide empirical support for the hypothesized patterns. The field studies are based on data on 407 596 unique customers over 2008-2011. The results are valid across customer segments and are in line with previous research. Of course, every company must find its optimal promotion spot across its main customer segments. 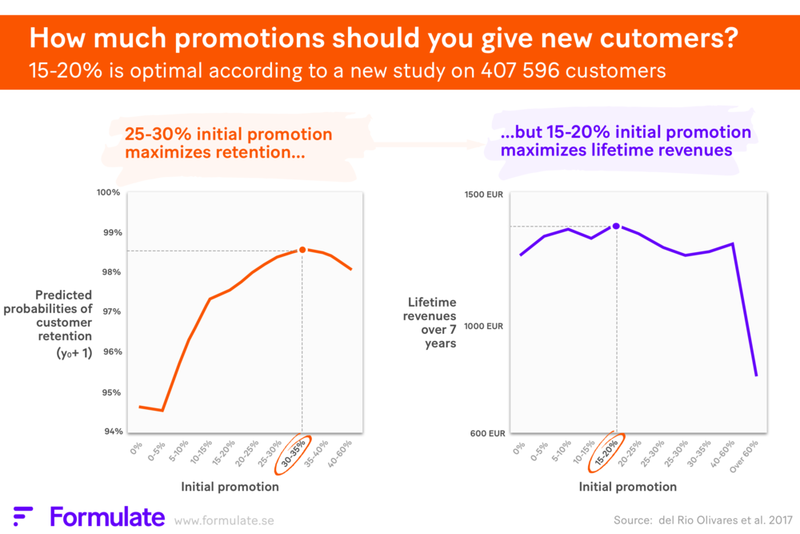 With that being said, these results provide a good starting point for using promotions more effectively to build sustainable long-term customer relations.